Jean-Pierre Mangin declares, "The 225 km of roads to Tete are not represented on the map shown." While that is true I wonder if the absence of roads constitutes an error or is simply a choice of features to include in a small space. On my stamp I notice another kind of error, a production error. 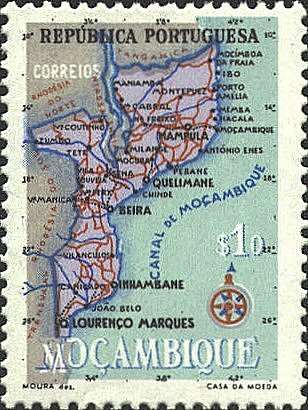 The "M" in MOÇAMBIQUE, and the left side of the design are 2 mm out of line with the green side. Also, the Scott catalog gives the color for the colony on this stamp as orange yellow, but on the stamp is purple. I checked Paul S. Greenlaw, Affordable Foreign Errors on the Postage Stamps of the World, but he does not report this one.